Hey, wake up, there’s a really annoying election campaign. One that everyone wishes would just leave them alone. The vote is on Friday, which is a blessed relief after the longest short election campaign in history. Here are a collage of thoughts that occurred to me over the past few weeks. Fine Gael took the electorate for granted, talked down to them, tried to hide their own shortcomings behind technocrat babble about fiscal spaces and then complained we were whingers for not appreciating what they’d done for us. Which is just to say, they were successfully Fine Gael throughout. Never mind the breathless talk about genius campaign teams and policy strategists. This remains a party that has never in its entire history managed to persuade the electorate that reelecting them is a tolerable option and yet has never knowingly asked itself why that might be. It still looks like they’ll break that streak this time- but still without a majority wanting it. Labour… I have no explanation for what they did to themselves while in government. None. But, they’re about to get their report card. Who knows, maybe the party is capable of asking itself the hard questions it’s never occurred to Fine Gael to ponder? On current form, they’re more likely to blame poor people and demand the Internet be regulated to remove things they don’t want to read. Sinn Fein have discovered gravity and failed to achieve orbit. This was their opportunity to break out as a major party and they Gerry Adams Northern Ireland the dead just found themselves being held back by some voter reluctance. Social Democrats: solid, honest, competent and straightforward- the Social Democrats have basically looked like a party from a completely different, better, universe to the rest of them. If they can manage to garner 50k first preferences nationally with only 14 candidates, they’ll be funded like the other parties and we’ll see what they’re really made of. Worth a strategic use of a No. 1. But, even relying on volunteers and donations (and, presumably horrible personal debt) for me, they’ve been the source of hope & the possibility of something better to come. 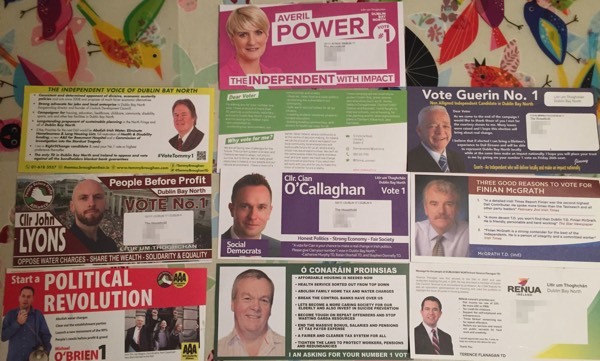 Fianna Fáil: FF are not like any of the other parties above. They exist as a patronage machine, doling out state goodies at every level of the power system to their supporters. Since entering the Dáil they have never been out of power for more than one term. This election will save or destroy Fianna Fáil. The party simply isn’t equipped for opposition- two terms of it is a decade without goodies to distribute. If it doesn’t get back into power, it may not exist by the next election chance. But it can go into power- no problem- after the election. It just has to join up as the junior partner to Fine Gael. It will do this. It must do it. It doesn’t matter what the cost is, or what will happen afterwards. And that cost might be nothing- no party better understands the working of the state’s machinery than Fisnna Fáil. They can deliver to their supporters, when there are resources to use to do it. But Fianna Fáil needs Fine Gael to get back into power. No other combination will have enough votes to form a government. So, a vote for Fine Gael has become the only vote likely to save Fianna Fáil from its own destruction. On Friday, power will do something astonishing. It will become liquid and then turn to a gas- breathed in and out by every voter in the state. Politicians, journalists and everyone who says what power is will find it has evaporated from them until the count is over. Eventually, the votes will be counted and power will condense back into the familiar solid lumps we’re used to hearing from on the TV. But, until then, for a brief moment, we decide what is going to happen next. I really love those moments. It’s even worth living through the campaign to get to it.